Once the antennas have been placed at the timing point, they need to be connected to the box. The cable sets come with one cable for each length, according to the distance of the box from the antennas. Open the cover of the cable guide and connect the cables to the antennas in order of length. The connectors are bayonet type, they should fit snugly into the sockets by turning them until they stop, without being forced. To disconnect them, pull them by the connector applying a little pressure. Be sure to attach the cables to their corresponding guides. This will prevent them from being damaged in the event of sudden pulls and jolts. The cables should remain at an angle of 90° from their position to the antennas. Be sure to close correctly the covers of the cable guides after connecting the antennas to the boxes. Place the cables as straight as possible as they exit the cable guides. Avoid bending them (keep the angle less than 90°). If the leftover cable length is too long, lay them out in a wide circle. Always try to use the shortest cables in your setup; the longer the cables to the antennas, the more chance there will be of loss in timing. For example, if you’re setting up a three meter timing point with three cable guides, of the four cables you’ll be using, use the shortest cables in the set, the shortest cable for the first antenna, the second shortest for the second antenna and so on, leaving out the longest ones. In boxes with 4 ports, you can connect the antennas to the UHF ports of the box in any order. 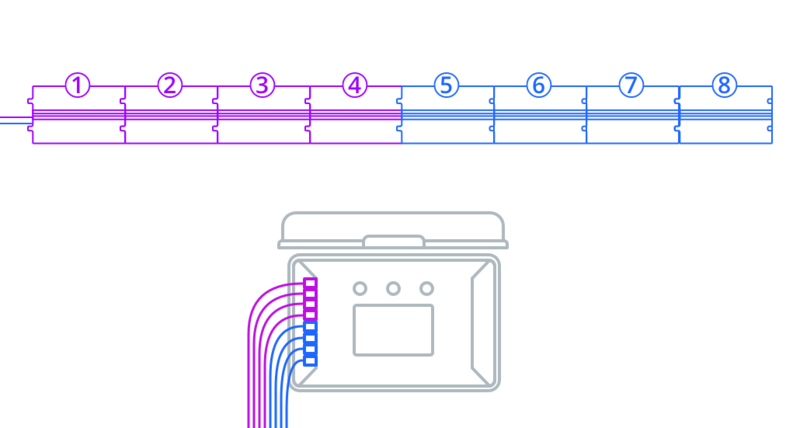 On an 8 port box, it’s very important that the first 4 antennas are connected consecutively to the UHF ports. Do the same for the last 4 antennas as shown in the diagram.